The OSCE welcomes the withdrawal of heavy artillery from the demarcation line in eastern Ukraine by both sides of the conflict, the deputy chief monitor of the OSCE mission told RT, adding that the organization needs to know where the weapons are heading. The Organization for Security and Co-operation in Europe (OSCE) “welcomed that both sides are now indicating that they are taking steps to comply with these responsibilities,” Alexander Hug told RT after news emerged that Kiev troops had begun their withdrawal. 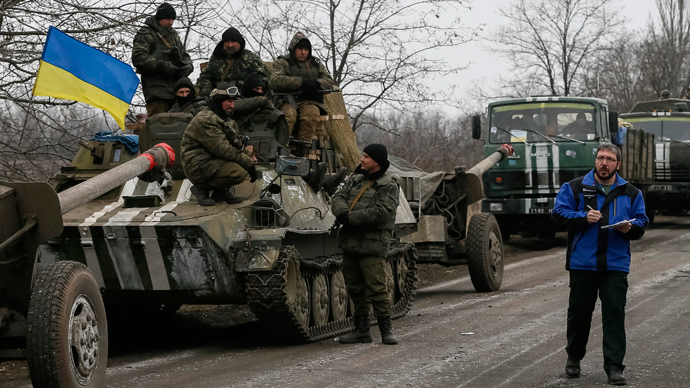 Meanwhile, the rebels have moved 90 percent of heavy weaponry from the demarcation line, according to a statement by their leader, Aleksandr Zakharchenko, on Thursday. Hug added that the OSCE needs to know the location, routes, and storage spaces of the heavy artillery before it can officially confirm anything. The withdrawal of heavy weaponry is a mandatory step set out by the Minsk ceasefire agreements signed earlier this month. Under the deal, both sides must pull their heavy weapons back from the demarcation line to form a buffer zone of 50 to 140km, depending on the type of weapon. The process is expected to be complete by March 1.